Bring a dazzling look to your bird sanctuary with the Droll Yankees Purple Ruby Sipper Window Hummingbird Feeder. The convenient size, hardy construction, and bold colors on this feeder add a brilliant look to your window, allowing you to enjoy hummingbird activity up close. The soft purple, polycarbonate reservoir holds 4 ounces of nectar, and three ports on the cap enable a few birds to dine at once. The bold red color on the cap aids in attracting the flying jewels to your window, while the petal shapes mimic a flower. The slight dome on this top directs water away from each feeding port, as well as forms a leak-proof unit. The cap lifts off the dish for refilling, and a nectar recipe printed on the bottom of the bowl acts as a handy guide. Install the included metal rod into the center of the item, and use the two included suction cups to affix the feeder to your window. Its polycarbonate construction withstands use for many seasons, and the lavender base keeps nectar levels visible. 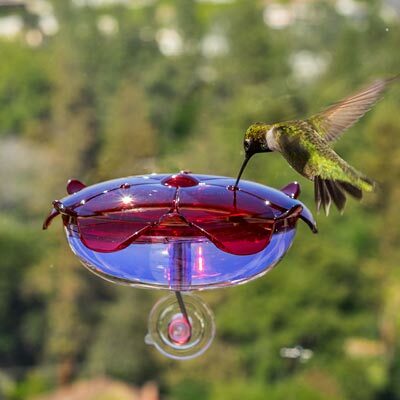 Enjoy the wonder of hummingbirds dining near you with this Purple Ruby Sipper Window Hummingbird Feeder. Made in the USA. Lifetime guarantee.